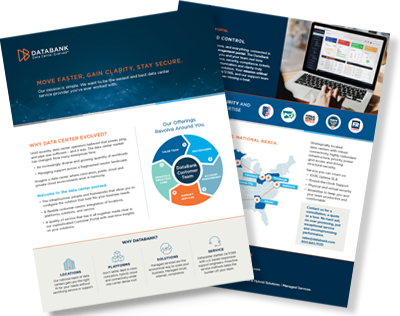 The SSAE 18 is the gold standard within the industry and an integral part of DataBank’s business model and security offering. Cyber security is a key strategic initiative across industries and safeguarding data is of paramount importance to our customers. This is especially the case for our clients in industries with high levels of regulatory scrutiny. SOC 2 standards are based on the proven SysTrust-derived standards of Availability, Security, Confidentiality, Privacy, and Processing Integrity. As a provider of data center services to some of the largest publicly traded companies in the world, DataBank commits to perform a rigorous SSAE-18 audit in every one of our data center facilities. Certification includes service auditor reports on the fairness of management’s description of the service organization’s system controls, design, and operating effectiveness over a one-year period. Audits are conducted by an impartial independent third party. The verification agency is the American Institute of Certified Public Accountants (AICPA) which conducts the audit to assure that the control activities described in a service provider’s audit are suitably designed to meet specified control objectives, and that those controls are in place and operating effectively. These reports are generally required by a variety of customers and their own auditors. Our compliance includes testing of managed services for operating systems and application level environments across control considerations, including user access, network monitoring and performance, backups, etc. This is where it’s critical to communicate with all intended parties regarding the contents of such a report as expectations need to be met for comprehensive reporting. By performing these audits proactively and delivering them to clients, DataBank saves them an enormous amount of both manpower and capital which would otherwise need to be performed by them. Performing these audit reports also allows for a de facto standard to be met in performing first-hand verification in conjunction with financial statement audits such as FISMA, FedRAMP, or Sarbanes-Oxley compliance.